Steve Jensen is a prominent and prolific artist on the Seattle scene, with public sculptures from Washington to Florida and China. 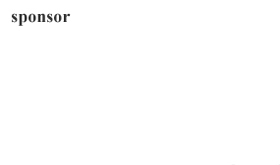 His work is in museums in Washington and California. 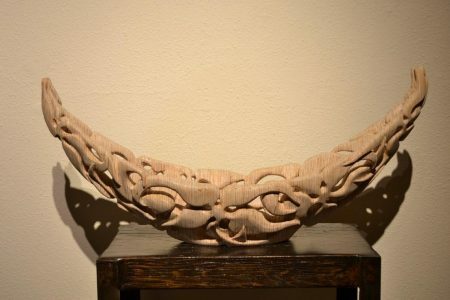 When I first saw his work in 1999, he was carving naturally felled logs into shapes reminiscent of a blend of Polynesian and Pacific NW totems. In this show, two-dimensional carvings like “Fish Tail” follow the theme of his early work. 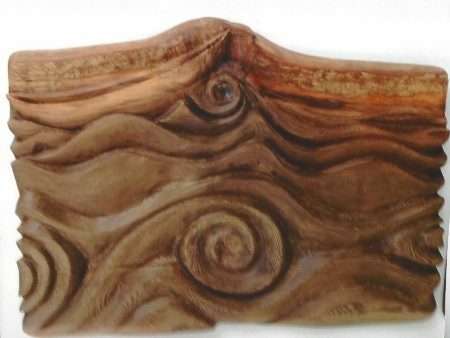 A less abstract work, “Skagit Canoe”, is a waterscape carved from a plank cut from a tree that had lain partly buried in mud for 300 years. A boat form rides the surface between the light and dark wood. As Jensen has developed, he continues to draw on the tradition of his family of fishermen and boat builders. 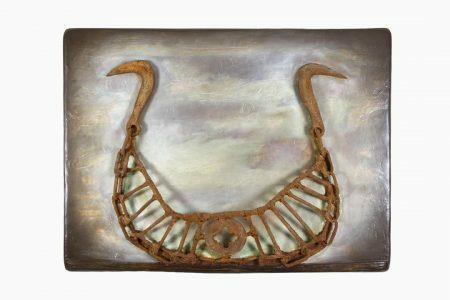 The delicately carved vessels in this show (“Starfish Canoe”, “Starfish Boat”) appear as strong as iron or bronze, showing complete mastery of his craft. Starfish Canoe, 2017; carved recycled plywood, 12.5 x 28 x 8 inches. “Green Boat in the Porthole” shows a painted boat floating above a reflectively calm surface. “Red Boat Floating in the Porthole” is a carved wooden moat mounted inside a double-paned bronze porthole. These mystical boats float in an ocean of memory and loss. 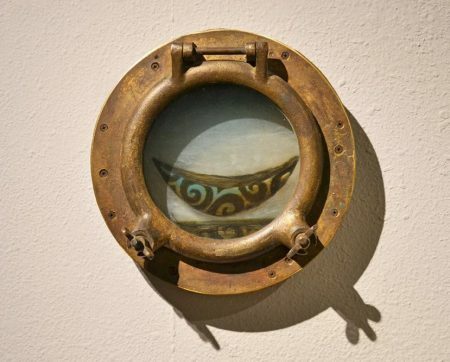 Green Boat in the Porthole, 2017; oil on plexi-glas, salvaged marine bronze, 13 x 13 x 4 inches. 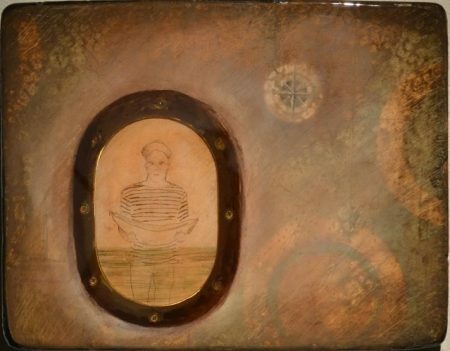 In addition, Jensen presents a series of portraits of sailors, seen through portholes mounted on wood. “Sailor at Rodes Reef” echoes with memory. We look through the shimmering surface into what appears to be a tenderly remembered past. The colors recede and advance like gently washing waves. Is the boat in the sailor’s hands about to embark on that calm sea? Or has he just pulled it from the water to hold so protectively? Another series is oil and plaster on wood with added beach detritus. Similar to the style of Anselm Kiefer, “Chained Viking” repurposes found steel into a boat form.